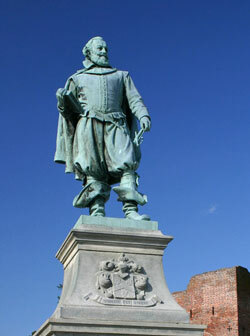 John Smith was involved in the Virginia Company’s plans to colonize Virginia for profit. In 1606, he led an expedition to the New World. Smith was one of the leaders selected to govern the Jamestown Colony. Smith and a small crew sailed from Jamestown in 1608 to explore and map the Chesapeake Bay and search for food supplies for the colonies. They explored and mapped the Bay from it’s mouth at Smith Island and Cape Charles to the northern tip and well into many of its tributaries. During his travels, Smith met up with Powhatan Indians, from whom he learned the names of many of the rivers and places he mapped. The maps produced by Smith were remarkably accurate and many of the place names on the old maps are still in use today. Upon his return to the colony, John Smith was elected as the Jamestown council president. He lead with strong discipline, encouraging work from lazy colonists by declaring that, “he who does not work, does not eat.” In 1609, Smith returned to England for treatment of a gunpowder injury. He never returned to Virginia again.